...That the Lord made specific promises to his people? ...That the Lord has a successful way forward for each of his children in this unique generation? ...The reasons this generation is different than any other? ...That it is not difficult to understand the signs of the times? 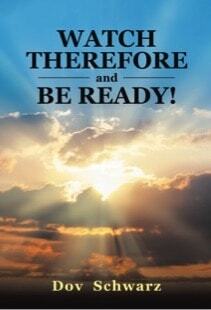 ...How to be ready for the imminent coming of the Messiah Jesus for his people? …How to know you will hear from our Lord Jesus “well done thy good and faithful servant”? By the time you finish reading Watch Therefore and Be Ready you can be uniquely equipped to Watch Therefore and Be Ready for the coming of our Messiah Jesus and to live a powerful life of faith during this uniquely difficult generation. For a gift of any amount to Watch Therefore, Blessing Israeli Believers, or Poured Out for the Nations UPON REQUEST you will receive a copy of Watch Therefore and Be Ready! Make sure to add in the memo section by check or notes section online: Watch Therefore Book. Please add "Watch Therefore Book" in the note section if you would like a copy of the book. Please add "Watch Therefore Book" in the memo section if you would like a copy of the book.